This ticket allows an adult (18+) access to the Dreambeach Villaricos 2019 from Wednesday, 7th of August to Sunday, 11th of August. This ticket allows an adult (18+) access to the Dreambeach Villaricos 2019 and the Camping Area from Wednesday, 7th of August to Sunday, 11th of August. This ticket allows an adult (18+) VIP access to the Dreambeach Villaricos 2019 from Wednesday 7th August to Sunday 11th August. This ticket includes: VIP customer parking Exclusive lane for VIP customers bracelet exchange Access to exclusive VIP area Exclusive visibility zones Official festival merchandise pack Free access bracelet for all Festival days. This ticket allows an adult (18+) VIP access to the Dreambeach Villaricos 2019 and the Camping Area from Wednesday 7th August to Sunday 11th August. This ticket includes: VIP customer parking Exclusive lane for VIP customers bracelet exchange Access to exclusive VIP area Exclusive visibility zones Official festival merchandise pack Free access bracelet for all Festival days. 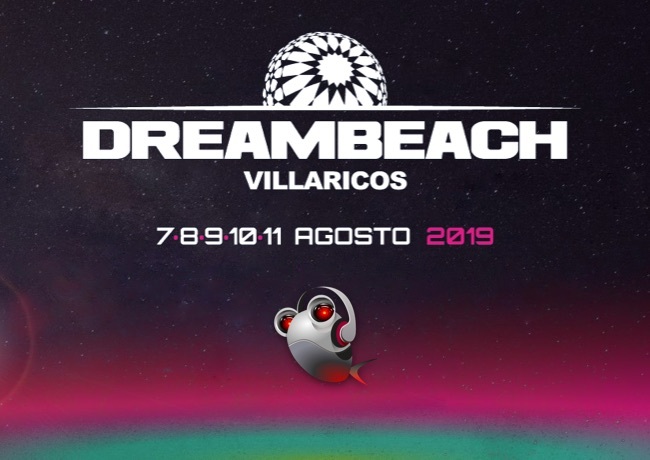 This ticket allows a minor (between 16 and 18 years old) access to the Dreambeach Villaricos 2019 from Wednesday, 7th of August to Sunday, 11th of August. This ticket allows a minor (between 16 and 18 years old) access to the Dreambeach Villaricos 2019 and the camping area from Wednesday, 7th of August to Sunday, 11th of August. 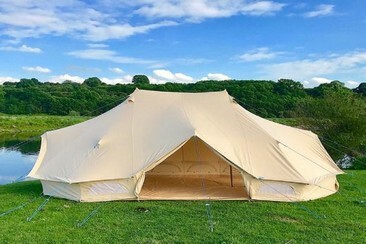 If you are tired of fighting for a spot, carrying and setting up your tent when you are going to the festival, The Glamping Company is the perfect solution! 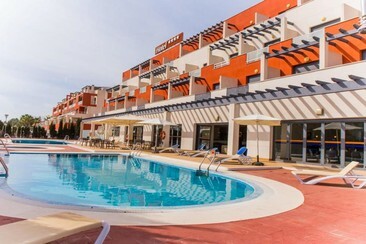 They offer different accommodation options fitting every budget and need. 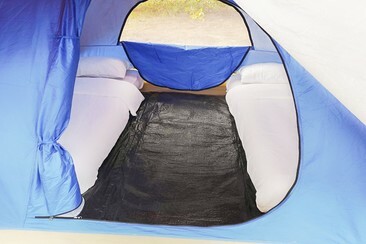 Easy Tents are pre-pitched for 1 or 2 people. They feature a quilted floor with 3 yoga mats of 10mm inside, flashlight and padlock gift as well as the 24/7 reception to make your stay an exceptional experience. Festival Tickets are not included in your accommodation price, and must be booked separately. If you are tired of fighting for a spot, carrying and setting up your tent, The Glamping Company is the perfect solution! They offer different accommodation options fitting every budget and need. Easy Tent Deluxe are pre-pitched tents for one or two people. They feature inflatable beds with complete bedding set(s), and a torch & padlock are provided. Breakfast is included and is served from 9:00 to 12:00 with fruit, juices, coffee, pastries and bread. You will also receive a welcome drink! Festival Tickets are not included in your accommodation price, and must be booked separately. - Double or individual cabin, installed inside a container with central power & air conditioning systems - Features: single or double bed, mattress, complete bedding set, towel, waterproof dressing mirror - Terrace area - one side of the container can fold to the floor to became a terrace with tables and sunshades - The container is connected to a power supply - LED intelligent sliding central control, temperature display, calendar function, reading lamp, backlight headlight, ceiling light - LED backlight display, sci-tech ceiling, hollowed-out dreamlike ceiling (double ceiling) - Toughened glass leaning plate, electronic safe, fire extinguisher, smoke alarm, ergonomic skidproof staircase - Adjustable air conditioning cycle system, new air ventilation (M3/h): 30, Advanced bedplate (flame retardancy, bug prevention, anti mildew) Breakfast & welcome bottle included! If you are tired of fighting for a spot, carrying and setting up your tent, The Glamping Company is the perfect solution! They offer different accommodation options fitting every budget and need. 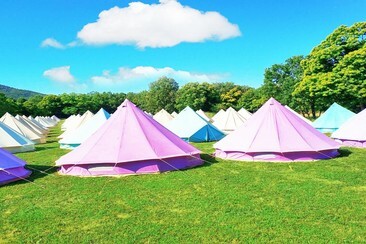 Bell tents are pre-pitched tents for up to four people. They feature inflatable beds with complete bedding set(s), bedside table, wastebasket, ice bucket, torch, padlock and a welcome bottle! Breakfast is included and is served from 9:00 to 12:00 with fruit, juices, coffee, pastries and bread. Festival Tickets are not included in your accommodation price, and must be booked separately. If you are tired of fighting for a spot, carrying and setting up your tent, The Glamping Company is the perfect solution! They offer different accommodation options fitting every budget and need. 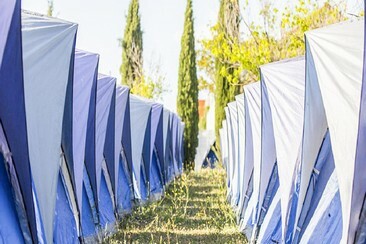 Emperor tents are pre-pitched tents for up to eight people. They feature inflatable beds with complete bedding set(s), bedside table, wastebasket, ice bucket, torch, padlock and two welcome bottles! Breakfast is included and is served from 9:00 to 12:00 with fruit, juices, coffee, pastries and bread. Festival Tickets are not included in your accommodation price and must be booked separately.